Kenney Mencher: What we know about the White House proposal to eliminate the National Endowment for the Arts, and how you can get involved. What we know about the White House proposal to eliminate the National Endowment for the Arts, and how you can get involved. Today, President Trump submitted his administration's first budget request to Congress. The proposal calls for an elimination of all funding for the National Endowment for the Arts (NEA) in fiscal year 2018. 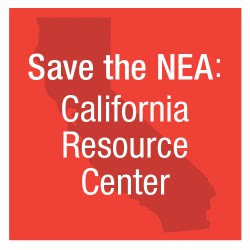 With this news about the proposed elimination of the NEA, the California Arts Council has published a webpage to serve as a resource for the field, the public, and other stakeholders wishing to learn more about the situation and how they can become involved in local and national advocacy efforts. This page will be updated regularly as new information and resources become available. If this budget is enacted, the elimination of the NEA would have dire consequences for every state, including California. For a synopsis of what's at stake, please see The National Assembly of State Arts Agency's Statement on Proposed Elimination of the NEA. Click here to read a statement from Jane Chu, Chairman of the NEA. Keep in mind, the proposed White House Budget is the first -- not the final -- step in the FY 2018 appropriations process. The President's request outlines his administration's policy priorities. However, Congress holds the constitutional authority to appropriate funds to federal agencies. You can use your voice to tell Congress that the elimination of or radical reductions to the NEA are unacceptable to taxpayers. As a supporter of the arts, you know that the impact of the NEA is essential, and wide-reaching. Each $1 in NEA grant funds leverages another $9 from other public and private sources. The NEA's grants and programs are powerful examples of how the arts are a vital part of our everyday lives. This power can be seen in communities across the nation, and California is no exception. Yet, the NEA's $148 million budget represents just 0.004% of the federal budget, less than 1/2 of one hundredth of one percent. It is important to be reminded at this time that the arts have benefited from bipartisan support for many decades. This is true in California and nationally. In fact, under our last Republican president, appropriations to the NEA increased by $40 million, while the Republican Party controlled both chambers of Congress for four of those eight years. Leaders from all political parties can be engaged in supporting our country's investment in culture and the arts. Copyright © 2017 California Arts Council, All rights reserved.